Main River Apartments offer guests the feeling of home away from home with apartments featuring a bathtub, kitchen, separate sleeping area and a seating area. 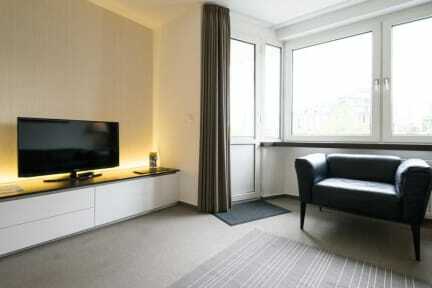 Our property consists of various serviced apartments. At the check-in we’ll lead you to your individual unique apartment. You will find all the needed amenities inside the apartment. All our representatives speak German and English. Main River Apartments are located just 1 minute away from the Museum Riverbank which has a large concentration of museums there. Perhaps the leading one is the Städel art gallery. The main train station is just about 3-4 minutes away and is the biggest public transportation link of the city. Around the main train station you will find international restaurants, bars, cafes and clubs. Close by is the newly built shopping mall “Skyline Plaza” which hosts over 170 stores, restaurants and boutiques. The city center (Zeil and Römer) can be reached within 10-15 minutes by foot. All our rooms are individual apartments with 2-3 rooms, own kitchens and bathrooms. Each unit can host up to 4 guests. Some of the apartments have a balcony. In all our apartments you’ll find fresh towels and linens, shampoo and shower gel. 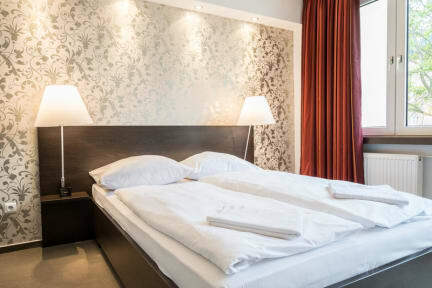 All apartments include high speed WIFI, hair dryers, shower/bathtub, HD TV, heating, Ironing facilities and many more. Of course, each apartment has enough space to store your luggage. Our apartment kitchens are fully equipped to cook a great meal. Kitchens have stoves, water cookers, microwaves and ovens. You’ll find everything you need for a pleasant stay. No Reception. Guest should contact us 20-30 min before arrival at the site. Thank you for booking at Main River Apartments. Please note: We do not have a reception. Please contact our booking manager Mike Schneider. You can call / SMS or What's App / WeChat/ Line / Telegraph Mike or send us an email. 2. How can we contact you in case of need? 3. Do you have special wishes? 4. We kindly ask you to leave the apartment at the departure day no later than 11.00am. Otherwise we will charge additional fees. 7. For an additional fee we offer a daily cleaning service. Please tell us if this service is needed upon check-in. General cleaning service: 15€ per cleaning. Extended cleaning service: 25€ per cleaning. Includes change of linens and towels. Please contact Mike directly . You can call / SMS or What's App Mike or send us an email to. Wish you a save trip to Frankfurt.